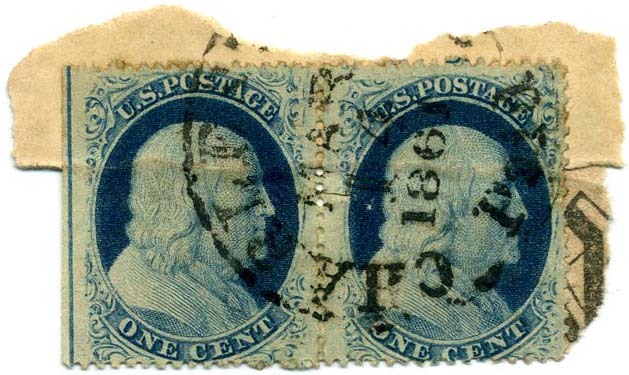 US 24, 1¢ blue PAIR tied on small part of a newspaper with CHARLESTON / SC // MAR / 14 / 1861 cds, CONFEDERATE STATE USE OF US POSTAGE, small faults, SCV $300. $160. 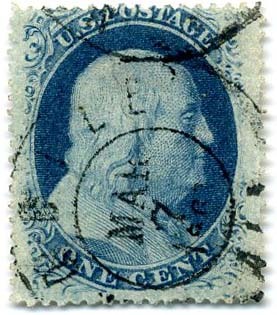 US 24, 1¢ blue with PARTIAL IMPRINT tied on small piece with MOBILE / ALA // MAR / 12 / 1861 dcds, CONFEDERATE STATE USE OF US POSTAGE, small faults from overhanging stamp on right, SCV $150. $200. 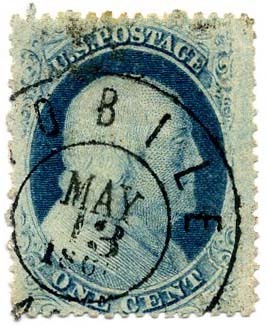 US 24, 1¢ blue tied on small piece with MOBILE / ALA // APR / 6 / 1861 dcds, CONFEDERATE STATE USE OF US POSTAGE, SCV $150. $150. 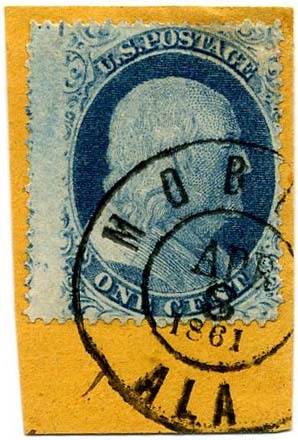 US 24, 1¢ blue tied on small piece with MOBILE / ALA // MAR / 7 / 1861 dcds, CONFEDERATE STATE USE OF US POSTAGE, SCV $150. $150. 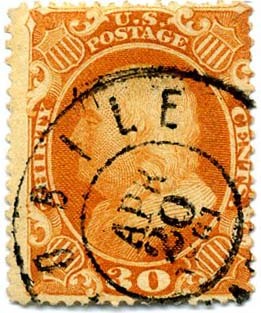 US 38, 30¢ orange, rich bright color, used with clearly struck MOBILE / ALA // FEB / 10 / 1861 double circle postmark, trace of red handstamp at bottom left most likely indicating a foreign destination use, trivial corner crease and tiniest thins, Pretty CONFEDERATE STATE USE OF US POSTAGE, 1997 P.F. certificate, SCV $1,000. $600. 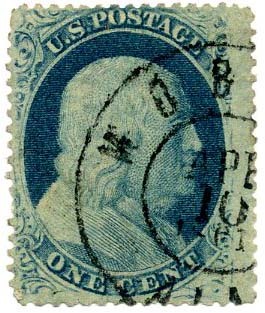 US 24, 1¢ blue used with neat MOBILE / ALA // MAY / 13 / 1861 double circle postmark, CONFEDERATE STATE USE OF US POSTAGE, SCV $150, CCV on cover $600. $150. 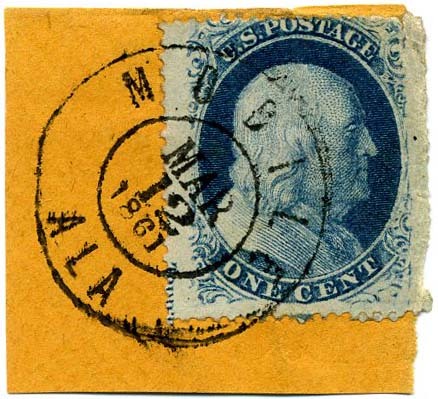 US 24, 1¢ blue used with boldly struck MOBILE / ALA // APR / 10 / 1861 double circle postmark, CONFEDERATE STATE USE OF US POSTAGE, SCV $150, CCV on cover $600. $150. 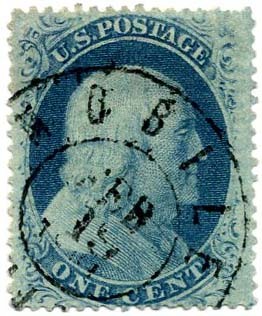 US 24, 1¢ blue used with boldly struck MOBILE / ALA // APR / 19 / 1861 double circle postmark, CONFEDERATE STATE USE OF US POSTAGE, SCV $150, CCV on cover $600. $170. 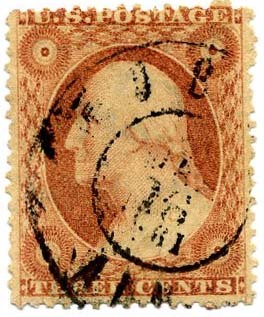 US 26, 3¢ red, pretty shade, used with lightly struck MOBILE / ALA // JAN / 16 / 1861 double circle postmark, INDEPENDENT STATE USE, Pretty shade. $75. 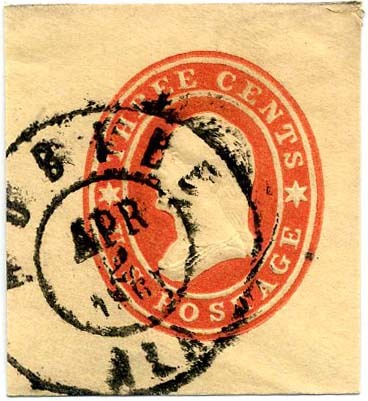 US 26, 3¢ dull red used with boldly struck MOBILE / ALA // MAY / 22 / 1861 double circle postmark, CONFEDERATE STATE USE OF US POSTAGE, $90. US U27, 3¢ star-die cut square used with MOBILE / ALA // APR / 20 / 1861 double circle postmark, CONFEDERATE STATE USE OF US POSTAGE, $70. 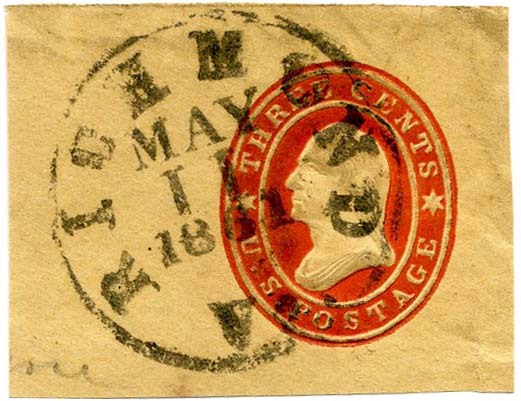 US U27, 3¢ star-die cut square used with bold neat MOBILE / ALA // APR / 2 / 1861 double circle postmark, CONFEDERATE STATE USE OF US POSTAGE, $90. 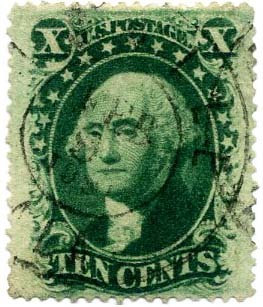 US 35, 10¢ green, rich color, used with neat bold MOBILE / ALA // FEB / 9 / 1861 double circle postmark, CONFEDERATE STATE USE OF US POSTAGE, SCV $200, SCV on cover $1,000, CCV $1,500. $375. 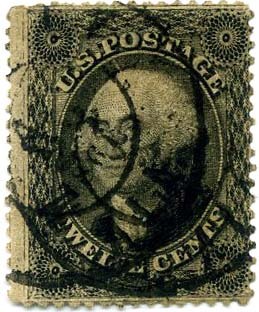 US 36B, 12¢ black used with MOBILE / ALA // APR / 23 / 1861 double circle postmark, CONFEDERATE STATE USE OF US POSTAGE, SCV $500. $375. 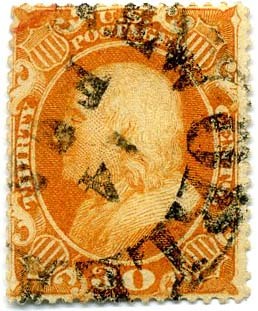 US U27, 3¢ star-die cut square tied bold RICHMOND / Va. // MAY / 11 / 1861 cds, such CSA Use of US Postage only for 45 days. $150. 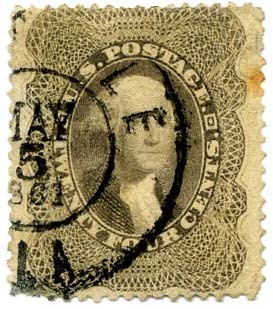 US 37, 24¢ gray lilac, nicely centered, used with neat bold MOBILE / ALA // MAY / 5 / 1861 double circle postmark, small edge thin at lower left and perf stain at right, CONFEDERATE STATE USE OF US POSTAGE, SCV $1,000, SCV on cover $5,000. Scarce use. $250. 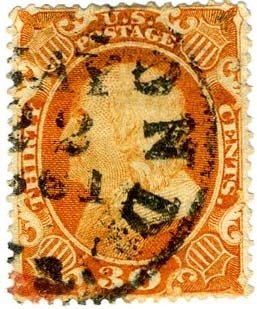 US 38, 30¢ orange canceled by NEW ORLEANS / LA. 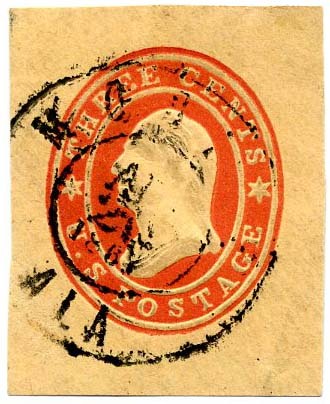 // FEB / 14  cds, CONFEDERATE STATE USE OF US POSTAGE, Valentine’s Day Use, Fine, Ex Gray, SCV $1,000. $400. 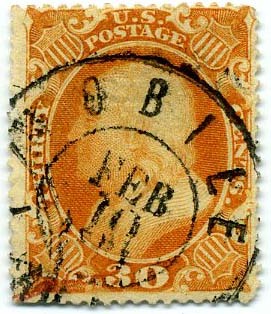 US 38, 30¢ orange canceled by neat MOBILE / ALA. // APR / 30 / 1861 dcds, CONFEDERATE STATE USE OF US POSTAGE, tiny expert backstamp, Fine, Ex Gray, SCV $1,000. $600. 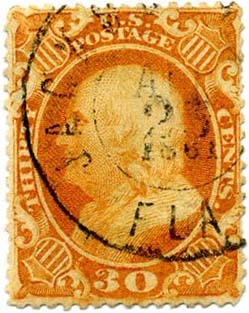 US 38, 30¢ orange canceled by RICHMOND / [Va.] cds, 2014 CSA certificate giving no opinion as to month of use (March or May 1861). 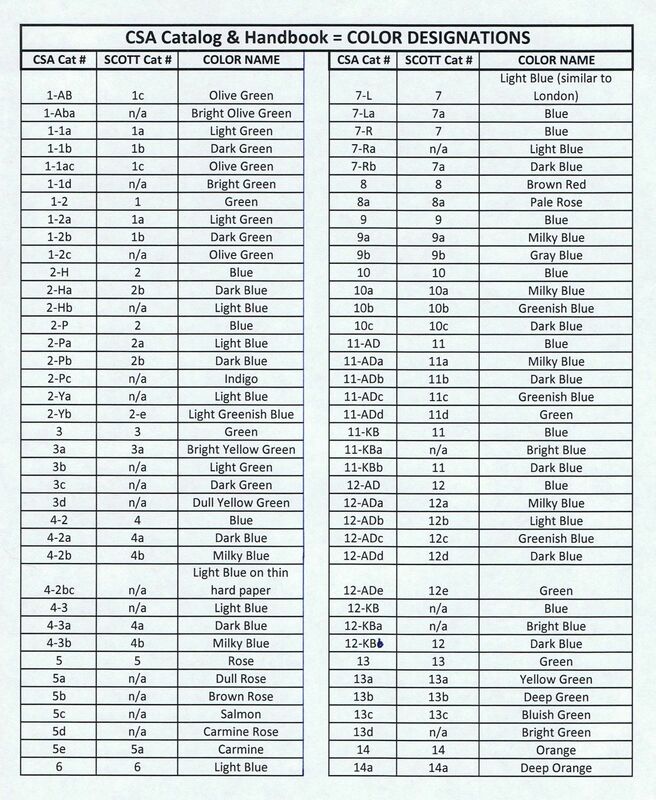 If it is March U.S. use, SCV $425; if it is May CSA Use of U.S. Postage, SCV $1,000; Ex Gray. $300. 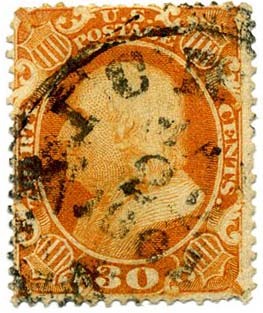 US 38, 30¢ orange canceled by JACKSONVILLE / FLA // APR / 25 / 1861 cds, CONFEDERATE STATE USE OF US POSTAGE, pinhole, couple small thins and creases, 2000 PSE certificate, Ex Curtis and Gray, SCV $1,000. $450. 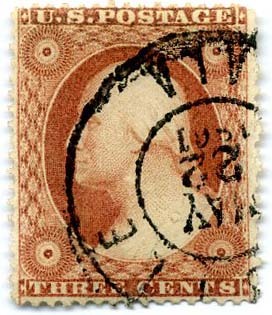 US 38, 30¢ orange canceled by neat RICHMOND, Va. cds, tiny tear at upper left, CONFEDERATE STATE USE OF US POSTAGE, 2000 PSE certificate, Ex Waske and Gray, SCV $1,000. $700.